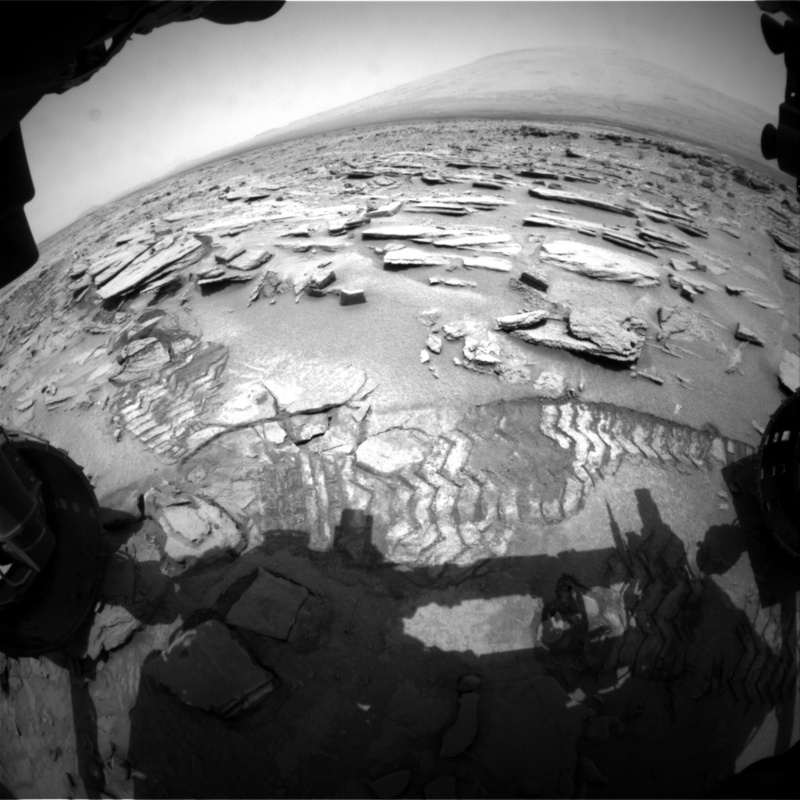 Curiosity is now back at the intriguing Shaler rock outcrop, after having initially passed it during its first trip into Yellowknife Bay in Gale crater. Shaler consists largely of “stepped” flat rock slabs which stand out from the surrounding rocks and soil. 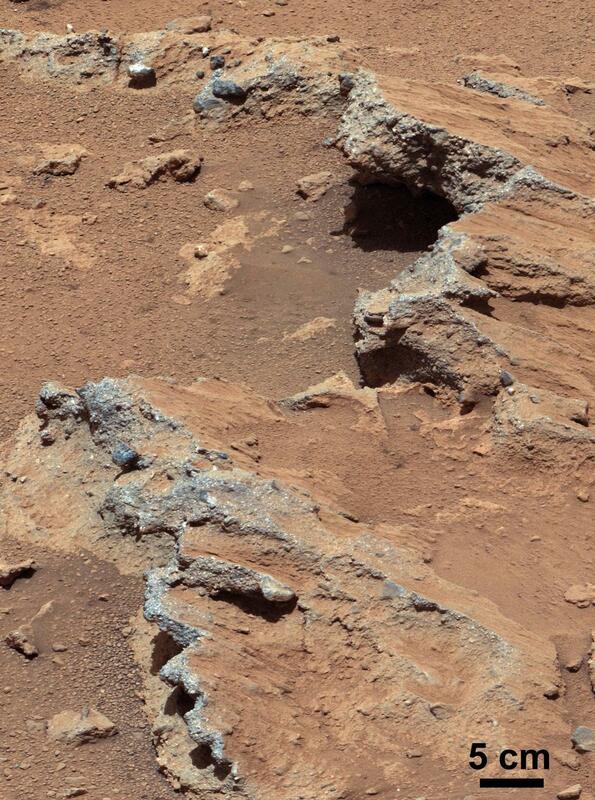 It’s origin isn’t known yet, but may be connected to the fact that this area was once very wet, with flowing streams and possibly a lake, according to findings so far by the rover. Curiosity’s findings here should be interesting, and then the journey begins to the layered foothills, buttes and mesas of Mount Sharp! As Curiosity starts moving towards Mount Sharp again, a few more of those odd “bubble” features have been seen. The most obvious ones are oval-shaped, with raised rims, and appear to be a bit larger than some others seen previously. Like the others though, they sort of look like frothy bubbles which have “popped” and then hardened. 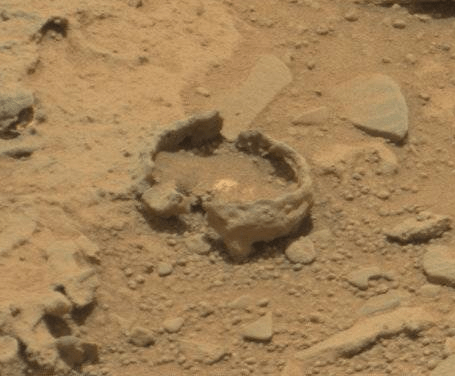 How they formed is still a mystery which hopefully Curiosity can shed some more light on. 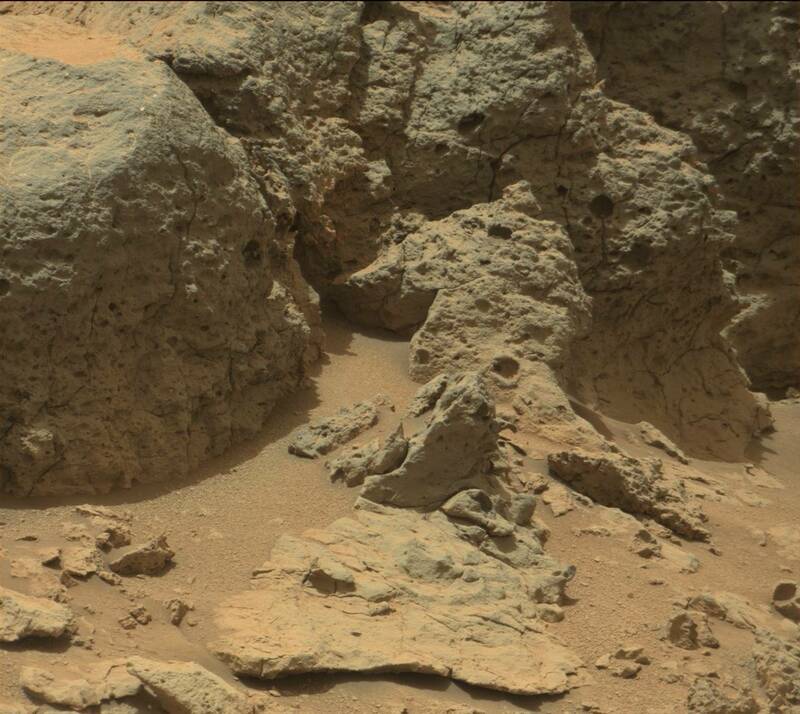 Some nice new MAHLI and Mastcam images of the rock outcrop Point Lake, taken by Curiosity as it starts its long drive to Mount Sharp. Lots of interesting small holes and nodules. Click images for larger versions. Further analysis should determine whether these rocks are sedimentary or volcanic in origin. All Curiosity raw images are available here. One of the conglomerate rock outcrops, called Hottah, which contains embedded streambed gravel. Other gravel lies loose on the ground nearby. As announced a while ago, one of the most exciting discoveries by the Curiosity rover on Mars so far has been an apparent ancient streambed which once flowed right through the landing site. Now, additional examination of the evidence confirms that it is what it seemed to be – a very old, now long-dry, riverbed. 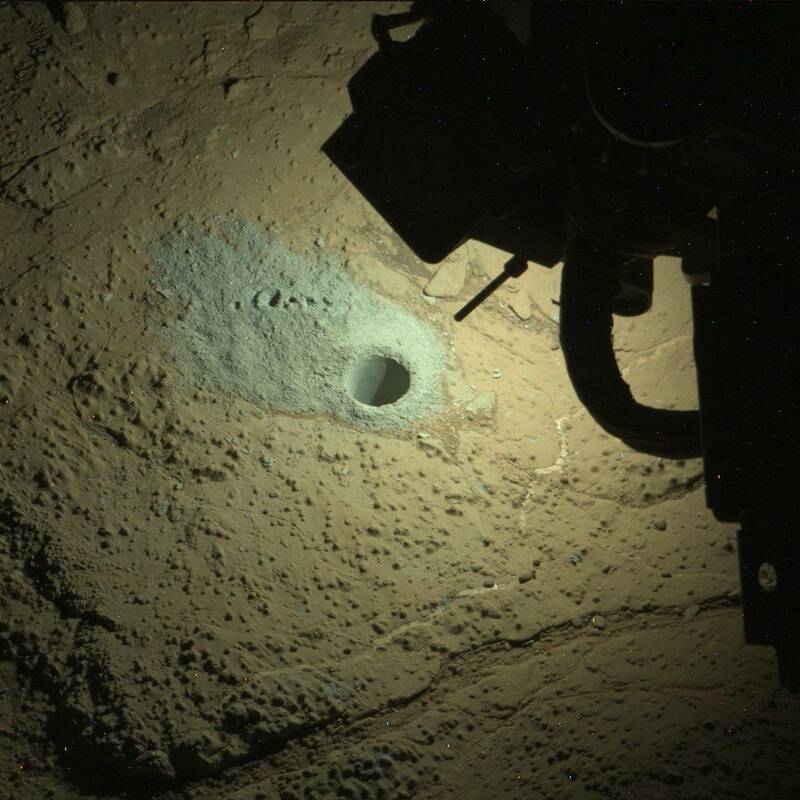 The Cumberland drill hole. 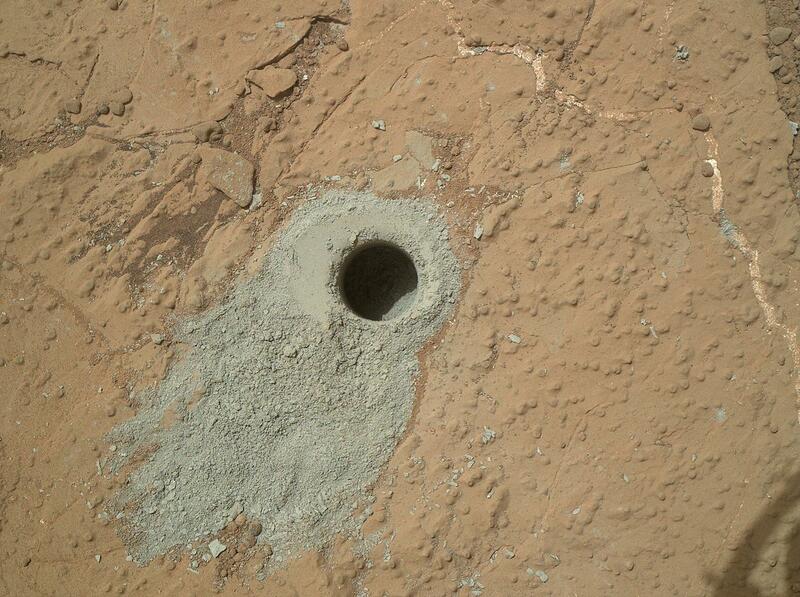 Like with the previous drilling, the powdered rock material is gray compared to the reddish colour on the surface.